Contemporary deluxe master bathroom. Everything in excellent condition. Great for contractors or renovation projects. 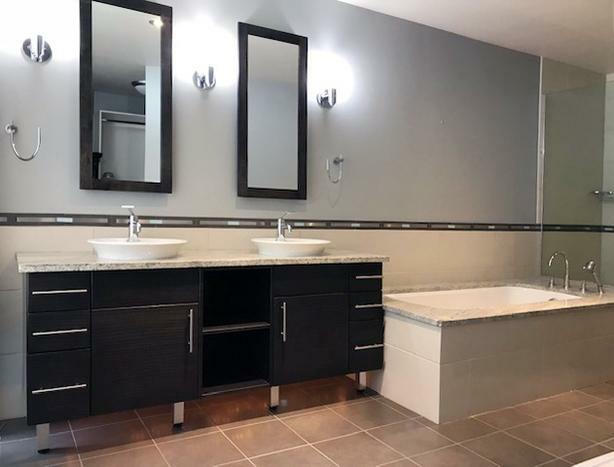 Double bathroom vanity Benson cabinets with granite counter top (Cashmere White), 2 white vessel sinks, contemporary taps, 2 mirrored medicine cabinets, drop in style soaker tub plus matching granite tub surround, frameless thick glass shower surround with door. 3 wall sconces. Serious inquiries only. Accepting offers for all as a package or sale as individual pieces.